We have a selection of 30 remarkable articles in 10 countries in April 2016: Belgium, France, Italy, Namibia, Netherlands, Poland, Singapore, Spain, UK, USA. Belgium: For two years now, Eiffage expanded its employee share plans to Belgium. 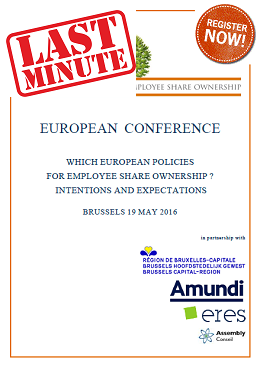 France: First quantitative study about employee share ownership in SMEs. Thermador is a remarkable case of employee share ownership in France. Serious concerns among the employee shareholders of EDF. New employee share plans for Nexans. Italy: Employee share ownership is still underdeveloped in Italy. Namibia: World Bank support for Standard Bank Namibia employee share ownership scheme. Netherlands: The number of employee shareholders decreased by 10% in The Netherlands. Poland: Vice-Prime Minister Morawiecki has now to shape the long-term plan for employee share ownership that he announced last month. Singapore: The basics of Employee Share Option Plans (ESOPs) in Singapore. Spain: The new legislation on employee-owned and participative companies. UK: Employee share ownership plans could offer a private-sector driven and sustainable tool to address inequality. A golden age for employee share ownership in the UK. USA: ESOP is a good idea, industry says. Chobani's CEO, the "king of yogurt" will give ownership stakes worth up to 10% to the 2.000 full-time employees of the company. Legislation to encourage the creation of ESOPs — including generous tax advantages for company owners who sell to an ESOP — has found supporters on both sides of the congressional aisle.